Learn to read the Hebrew Aleph-Bet by studying the First Day of Creation at Genesis 1:1-5 and the Decalogue from Exodus. Click on the books on top of the page to go back to the Home page. If you want to save a file, just right click on a link to "Save Target to" your computer. New things are added frequently -- click "refresh" to be sure you see all of the newest material. 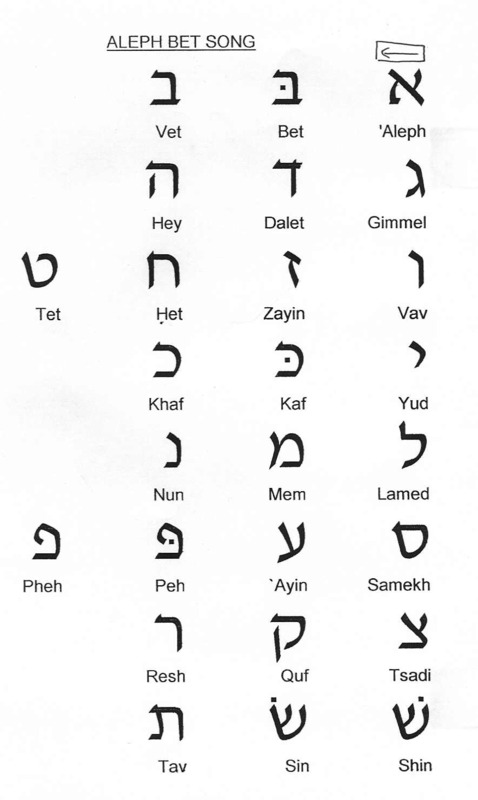 The buttons below will give you access to tools to help you read every letter of the Hebrew Aleph-Bet. The black button provides the whole written chapter for the lesson. The maroon buttons have video lessons and green buttons have video practice for each Hebrew letter. The blue button has a practice sheet that explains about the letter and has a reading practice at the bottom. The dark green button has the sound file that goes with the reading practice from the bottom of the lesson page. The pink buttons have flashcards to print every Hebrew letter combined with every vowel: print the Hebrew on one side and the English information which includes the names & sounds on the other side. The brown buttons are the Biblical text which corresponds to each lesson. The purple button has letter-matching exercises. (Improvements are still being made to these sites.